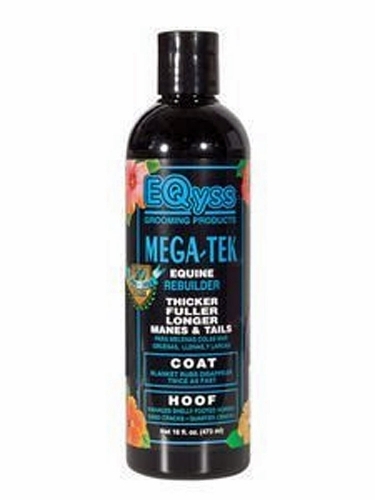 Mega-Tek is a revolutionary formula and a technological breakthrough. use of synthetic polymers, oils, or petroleum based products. conditions, or injuries. Makes hair healthier and stronger. Makes hooves grow 10% to 50% faster and makes them 30% stronger. hold better - fantastic for shelly footed horses. Ingredients: Deionized Water, Stearalkonium Chloride, Glycerol Stearate, Cetearyl Alcohol (Derived from palm Oil), Caster Oil Ethoxylate(40), Toccopheryl Acetate (Vitamin E), Panthenol, Hydrolyzed Keratin Protein, Cetrimonium Chloride, Tetrasodium EDTA, DMDM Hydantoin, Methylparaben, Propylparaben, Fragrance.